The September 2018 Justice and Spirit: Unitarian Universalist Book Club selection. 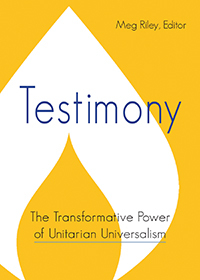 A dynamic collection of personal stories from people whose lives have been dramatically changed by Unitarian Universalism. Some have returned from the brink of despair, others have found renewed purpose and discovered the saving power of community. Together these vignettes paint a portrait of the real, felt impact of Unitarian Universalism. Readers can find a new appreciation for the ways Unitarian Universalism makes a tangible difference in the lives of real people who are struggling.